Six Game Home Stand Starts Tonight · Let's Go Amerks! The Rochester Americans start a six game home stand tonight against the Toronto Marlies, and concludes two weeks later on November 14th against the Chicago Wolves. There will be no lack of tough games in the coming weeks. Tonight the Amerks take on the Toronto Marlies for the first time this year. The Marlies are 3-3-1 so far and have a superior team to ours. If the Amerks want to win this game they are going to have to step it up a lot defensively to keep the puck away from our net for a while. Hitting some people through the boards wouldn’t hurt either. And let’s see Riley Emmerson get into another fight… at home… where the crowd can cheer him on! Don’t forget that tonight is Halloween. So, dress up, and come out and bring your kids to get some yummy candy during sweets in the suites. Yum. Tomorrow the Amerks take on the Hamilton Bulldogs for the first time of the season. They are 5-2-1 and don’t look like they are going to slow down any time soon. The game starts at 7:35 p.m.
On Friday, November 7th, the Manitoba Moose come into town to play the Amerks for the third time this season. This game also starts at 7:35 p.m. Manitoba has already beaten us twice this season. They are 5-2-0 this season. On Saturday, November 8th, the Houston Aeros will be flying in to play their only game in Rochester this season. The game, once again, starts at 7:35 p.m. The Aeros are 5-3-0 and are currently sitting at 3rd in the West Division. After a short trip to Syracuse, the Manitoba Moose are back again on Monday, November 10th. This game starts at 7:05 p.m. For those of you who work for the government, you have Tuesday off for Veterans’ Day. I know my father and at least 15 of his buddies from work will be at the game with my family and me. The Amerks finish up their home stand against the defending Calder Cup Champions, the Chicago Wolves on Friday, November 14th. This game, like all Friday and Saturday games, starts at 7:35 p.m. The Wolves are defending their title well this season. They are second in the West Division with a respectable 5-1-2 record. There are many games to choose from, or go to them all. I am very excited for a nice long home stand to get into. 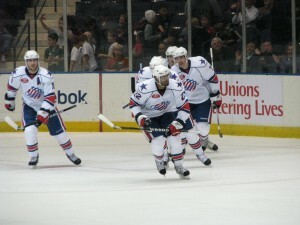 Let’s all hope and pray that the Amerks can come out of it with some points added to their total for the year.